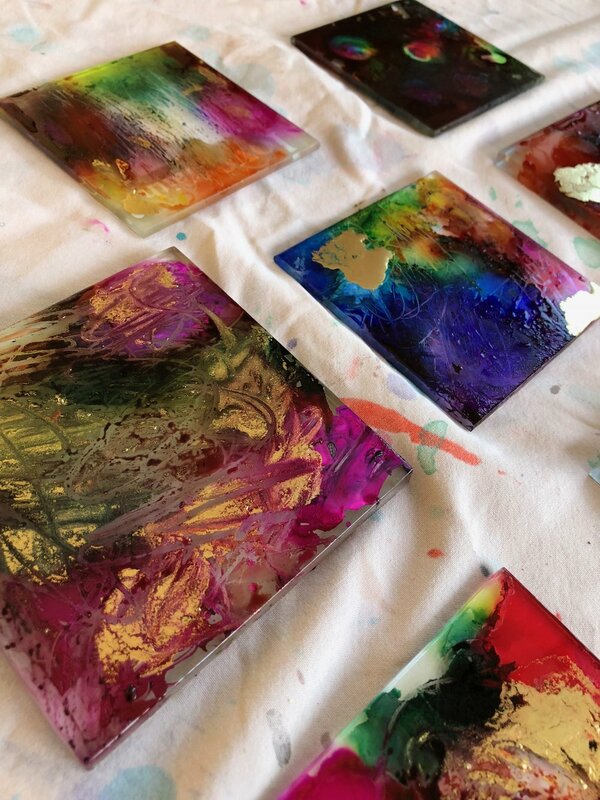 Work your creativity and crafting skills by using alcohol inks this winter! 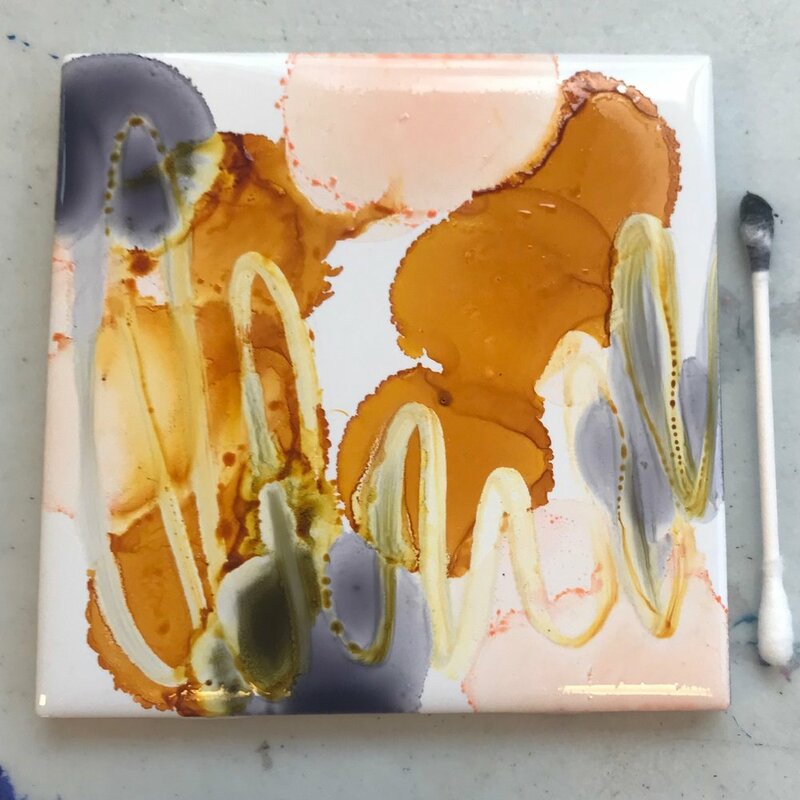 Alcohol inks are a simple way of making beautiful, colorful designs that can be achieved by children and adults alike. 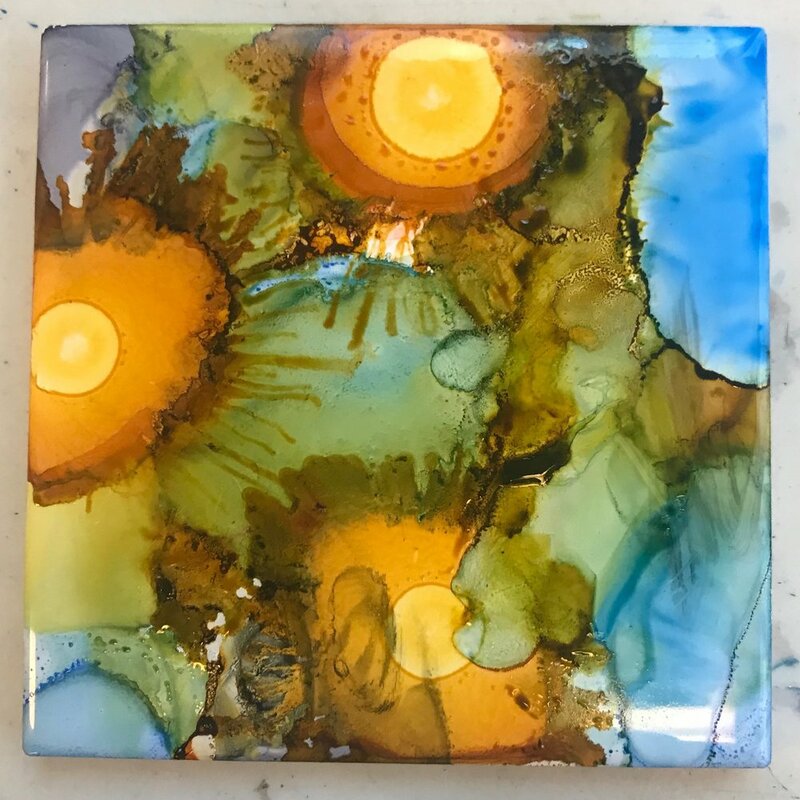 There are multiple options you can choose to make your canvas, including mugs, tiles, washers, and more. Nancy here! During my time working here, this is one of my favorite projects that I’ve had the chance to learn about and teach. My hands are currently stained from teaching this as a holiday gift-making workshop and it is so worth it! Every single artwork comes out differently, even when you’re trying to make them the same, and there’s nothing I like more than a unique piece of art. Alcohol inks -can be purchased online, at most crafting stores, or even made on your own! Glass from a picture frame, A plastic light cover, the possibilities are endless! Let’s get started! I decided to use a tile as my canvas today. I love these because of their versatility - you can put felt underneath and use them as coasters, get a small stand for them, or put them in a shadow box. If you’re choosing to do this with children (or if you’re a bit messy yourself), I highly recommend gloves and art aprons as these inks can stain skin and clothing. This craft is also a opportunity to help guide your child in using supplies sparingly by focusing on how colors interact together. A few drops go a long way! It’s always hard to know where to start and alcohol inks can be especially unpredictable, so I decided to just go for it and see where I ended up. First I added a few drops of mustard, then a light pink. Already I was eager to explore my texture tools so I busted out the straw and used some air to push around the second color I added. You have to act quickly if you want the colors to blend! If you want layers, allow the inks to set for a minute or so before adding more colors - please note that these inks dry a lot faster than most paints you may have worked with. After adding another color, I used a cotton swab to move the colors around. The nice thing about alcohol ink is that, if you aren’t liking something, adding a bit more ink makes a HUGE difference. Before this first one, I used a toothpick to scratch up some of the ink I’d set down, added some blue and green, and then used my straw again after adding more mustard and green. I love the texture that’s made with a strong, thin stream of air. I opted out of negative space this time around by not setting any tape before starting, so I decided to cover the white tile altogether. A little more mustard, some straw work, and more blue did the job! Do you notice the spots that formed in the third picture above? Those are made by adding drops of plain isopropyl anywhere that I wanted the colors pulled out slightly. If I used my cotton swab to make swipes, I could even remove any color or texture I wasn’t fond of. After adding a few more drops of alcohol, I used a toothpick to scratch in designs around those drops and anywhere I felt it looked a little dark. To add a bit more texture, I dipped an art toothbrush in alcohol and pulled the bristles just above my tile to create little lightened spots. Once I was feeling satisfied with how everything looked, I decided to try two different coating methods. You can see the Mod Podge coat on the left in the picture below. It leaves quite a bit of texture and also pulled in a bit of ink. I’ll likely do another coat once this has fully cured. On the right I used Diamond Glaze and made sure to cover all the way to the edge. This one also pulled up a little bit of ink, but is a lot clearer and has a much less texture. For this coating method I recommend keeping a toothpick on hand to pop any bubbles that form - there were quite a few! Spray paint is also handy, but do a couple coats with plenty of drying time in between. 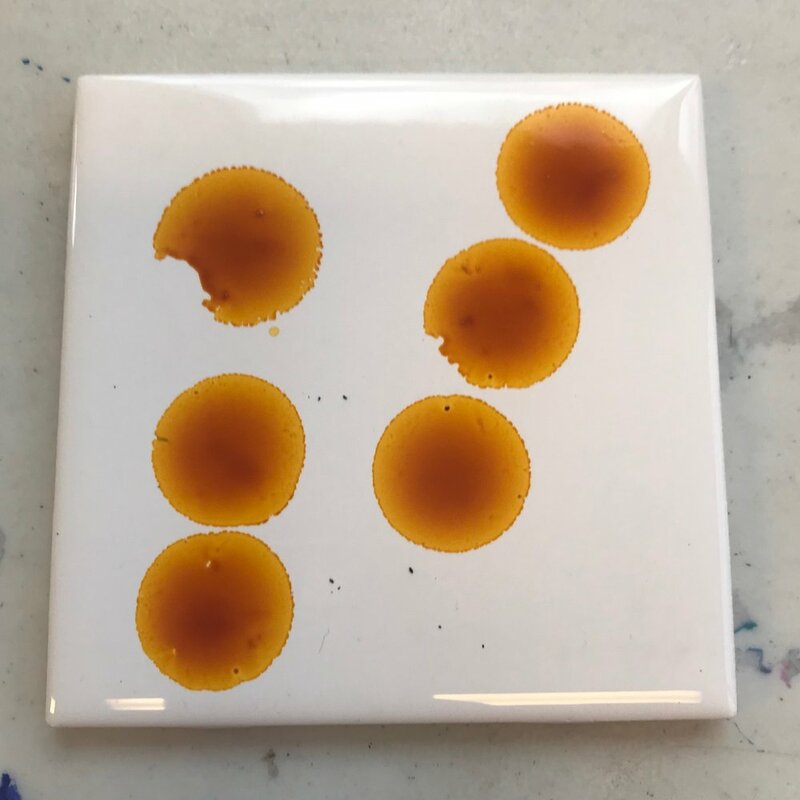 If you’re hoping for coasters instead of artwork, I highly recommend one of these last two methods, depending on your preference of texture. Both of these will clear up quite a bit once dry. It’s always hard to know when to stop with art. I think I struggle with that the most as an artist. When I look at what I’ve created, though, I try to look for all the little things I like, such as the balance of colors and how you can see them blending to share each of their spaces. I enjoy how nothing is quite centered - the darker rings around the lighter spots I chose not to scratch, and the unintended textures in between all the spaces I wasn’t deliberately thinking about. This is what I love about process art! I’m not really intending to create anything specific, I’m just opening myself up to the experience, the mess, and the joy of creating! After it’s all over I get to reflect on that and see what my own creative process has produced. Above is a selection of projects and techniques using alcohol inks. Top row- techniques; blowing wet inks, scratching off ink with toothpick, dripping metallic inks onto a dry surface to add accents (base layer was decorated with inks and alcohol, then allowed to dry before adding gold ink on top), drops of alcohol added on top of inks causing white spots to appear. 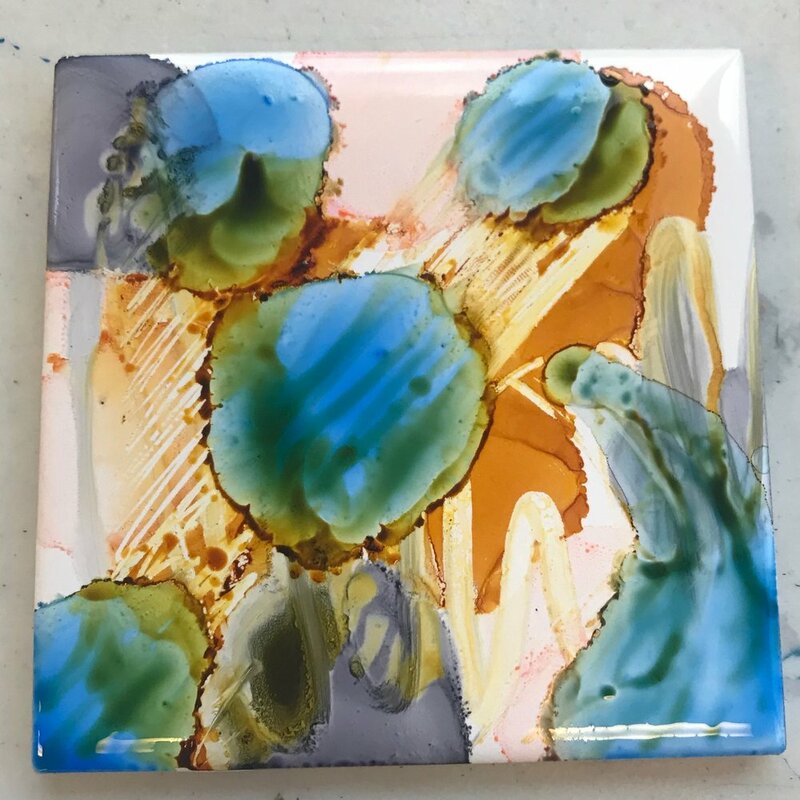 Second row- substrates you can use as your “canvas”; ceramic mugs, light switch plates, washers, glass. Bottom row- Finished products made by kids at Art Beast! Please share your experiences with this technique in the comments section below. Did you know that Art Beast makes a different themed dough EVERY single WEEK? That’s 52 scents & textures a year! You asked for it, you got it: our famous play dough recipe along with some pro tips from Art Beast Coaches. It’s got everything you need to make it at home, including a list of some of our favorite scents. 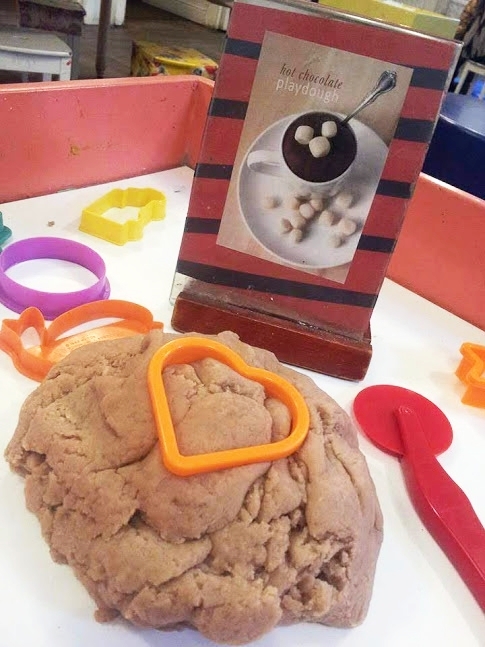 There are endless possibilities when making play dough - experiment with your little ones to come up with your own favorite scents and textures! 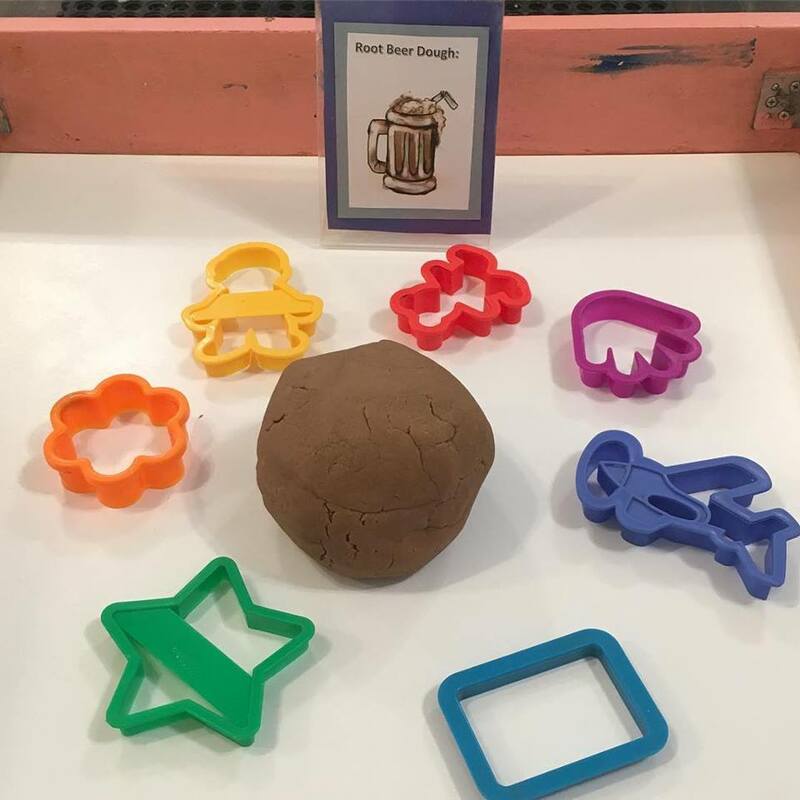 There are two methods you can use to make great play dough, the first is with the microwave and the second is with the coffee pot, kettle, or on the stove top. In a microwave safe bowl mix together dry ingredients. If using spices, add into dry mixture. Add vegetable oil and work into dry mixture until lumps are gone. Add water or juice slowly, working out any large lumps. Once mixture is combined completely, work in extract for scent and/or food coloring until it smells and looks to your preference. Put in the microwave for six 20-second increments, mixing in between and getting any film worked back into the mixture. Stop at any point when the mixture starts to get tacky instead of goopy. Let sit to cool. Once cooled, but warm enough to handle, knead dough until consistent in texture. If still too tacky when cool, do one more round in the microwave. Scent (opt) - can be extract or spices. Juice does not work well in this style. Boil water in kettle, pot, or coffee pot. In a heat safe bowl mix together dry ingredients. If using spices, add into dry mixture. Add vegetable oil and work into dry mixture until lumps are gone. If using any extracts and food coloring, start by adding them to 1/4 cup of water, then adding mixture to the dough, working out any large lumps. Slowly add more water as needed to make a soft dough consistency (you may not need the full cup of water). The heat will cook the dough as it sits. Once cooled, but warm enough to handle, knead dough until consistent in texture. Dough may be the slightest bit tacky, but as it cools it will cook itself a little more. DID YOU KNOW?Play dough is great for developing fine motor skills! 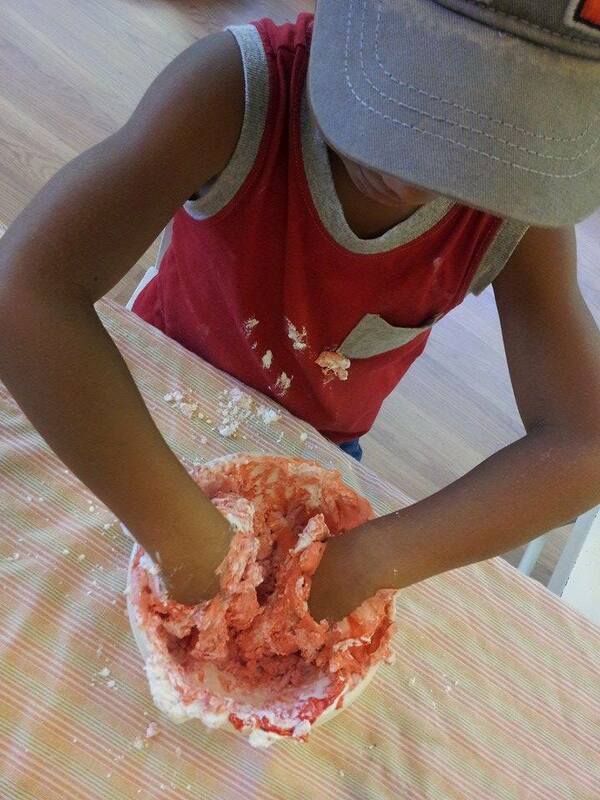 Besides being super fun, play dough is a great sensory experience for small hands. After making play dough together at home, help your little one practice rolling, cutting, smashing and building with the dough! Leslie -"I have so many favorites! Hot chocolate, any of the citrus ones, the herb doughs and ginger!" What’s your favorite? Post in the comments! Art Beast occasionally offers select “flavors” of our homemade dough for sale in the studio. Call to find out if we have any currently available. Be sure to join us each month on the first Tuesday at 10:00 a.m. to hear a special Usborne story book, sing songs and do some fun process art with your baby, toddler and preschoolers. As always, when you purchase any books from Nancy either at the studio or online, proceeds benefit Tubman House & Art Beast Development Center. Join us each month (we will have a break in January) to flip through a selection of books at Art Beast or go online to https://h5434.myubam.com and select Art Beast at check out! Ms Leslie will do a regular Teeny Tuesday every Tuesday with her usual routine. Join us! Nancy will share this super cute book, perfect for Valentine’s Day then we will create our own DIY cards by printing our hands and other pretty designs using ink pads. Join us to hear this beautiful book read aloud and then be inspired to help your little one create a nature themed paper collage. Together we will create food prints with tempera paint and both real and fake food items to go along with the read aloud book, “How to Feed Your Monkey”. We made a lovely, texture collage using painted on glue using paintbrushes (easier for little hands) and all sorts of fabulous textures of paper, fabric and other household items like sandpaper. 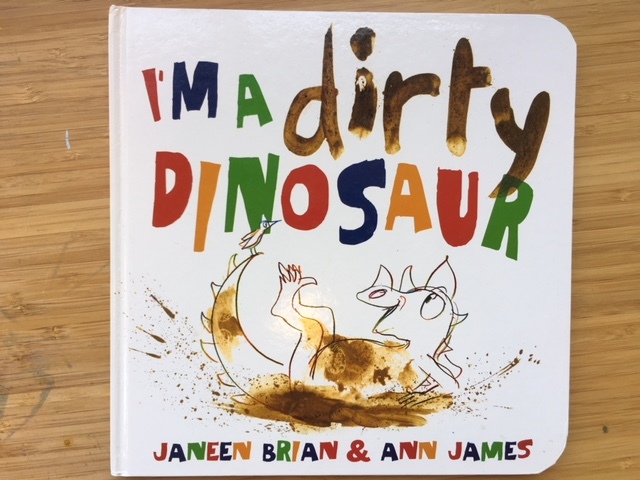 Nancy lead us in a “dirty” art activity that involved stamping toy dinosaurs in brown paint and “walking” them on large paper to create messy, muddy footprints. We then used a washing station to clean our dinosaurs and our hands. Once a month you can browse a specially selected assortment of fabulous Usborne books brought right to you! Feel free to simply look or purchase items in the studio or online. A portion of the proceeds ordered through Nancy or using the “art beast” code online at her link, always goes to provide new books to the Art Beast Child Development Center and Tubman House. 2018 Summer Camps. So much fun! Art Beast camps are designed for children 4 to 7 years old. We create a space that honors children by offering activities and environments suited to their age range. No trying to keep up with the 10 year olds at this camp! Each session fills at 16 children and is led by two teachers, promising a group that can grow close. The camps offer a blend of structured arts exploration in the classroom and free play within the building, always under close supervision by the camp teachers. Our camps are about exploring art and self-expression. Children dig into an array of mediums and arts in their own way. No matter the theme, we promise arts integration with movement, song, story, and art. After or before camp each day, you can stay and play at Art Beast with your child as long as you’d like. And, as always, when you choose Art Beast, your money supports Waking the Village’s communities for young, homeless parents and their children at Tubman House and Audre’s Emporium of New Tomorrows. In 2016, Art Beast generated over $50,000 to sustain Tubman’s child development program for children experiencing homelessness. Art Beast will be holding full day camps at 1949 Bell Street this Summer. The site occupies nearly an acre of land, allowing for LOTS of outdoor play and community games. Indoor and outdoor spaces are set up with open studio space, building stations, and dramatic play areas. Three goats live on site. Gardens, tree, and dirt trails invite free play and exploration. This site allows us to greatly expand our outside play offerings- a long time dream. It also allows the children attending the camp more space to explore so that a full day can offer plenty of room. Session Times: 9 am to 5 pm. The camp day will offer both directed activities and free play. Pricing: $250 a week. Additional siblings enrolled the same week receive a 15% discount. $75 non-refundable deposit to reserve a space. To Register: Complete the online form or call the studio. Though the themes repeat offerings from the K Street sessions, activities will be redesigned to offer more outdoor activities and crafts suited to an older age range. Spend the week building and exploring our very own rainforest! Your child will have a chance to learn about plants, animals, and the ecology of a jungle environment. Campers will help build make their own adventurer’s outfit, terrariums, and become jungle animals as we decorate the classroom throughout the week. Come and join us as we explore the nature all around us! Be prepared to get your clothes dirty and those thumbs green as we approach nature with a whimsical perspective and an artist’s mindset. Children will create take-home gardens, fairy houses, garden stones, and a framed, nature watercolor painting. Join us in this magical artistic exploration of art and garden-appreciation to take in the greenery around us! Let's take a trip around the world as we explore songs, dances, stories and art! Each day of camp will be an opportunity for campers to learn about a different region including Latin America, Asia, the Caribbean, the Pacific Islands, and coming back home! Campers will have many opportunities to sing freely, dance, read stories, imaginative play, and experience process-art activities. 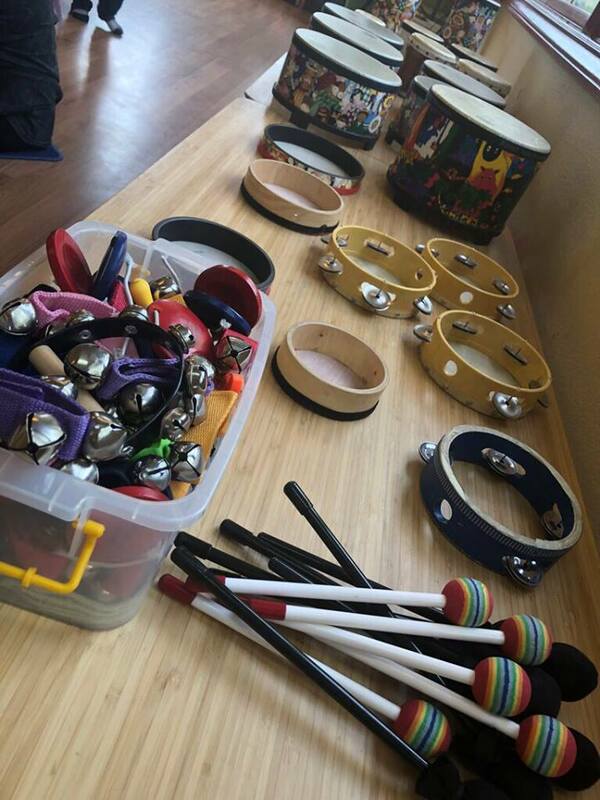 We will also have a station for learning basic music concepts such as rhythm and pitch. No previous music experience necessary. Welcome to the most fun & advanced superhero academy ever! New recruits are invited to come and train with the most intelligent and skilled superheroes in the world. As a part of this elite program, we will create our own superhero names, assemble our own armor (masks, super hero cuffs, shields and capes) using advanced technology, make radioactive slime and create long lasting friendships. By the end of the training we will discover what it takes to become not just a superhero, but someone who can make a difference. Campers will maneuver the seven seas above and below while we learn about creatures in the deep and the ecosystem that the ocean has to offer. 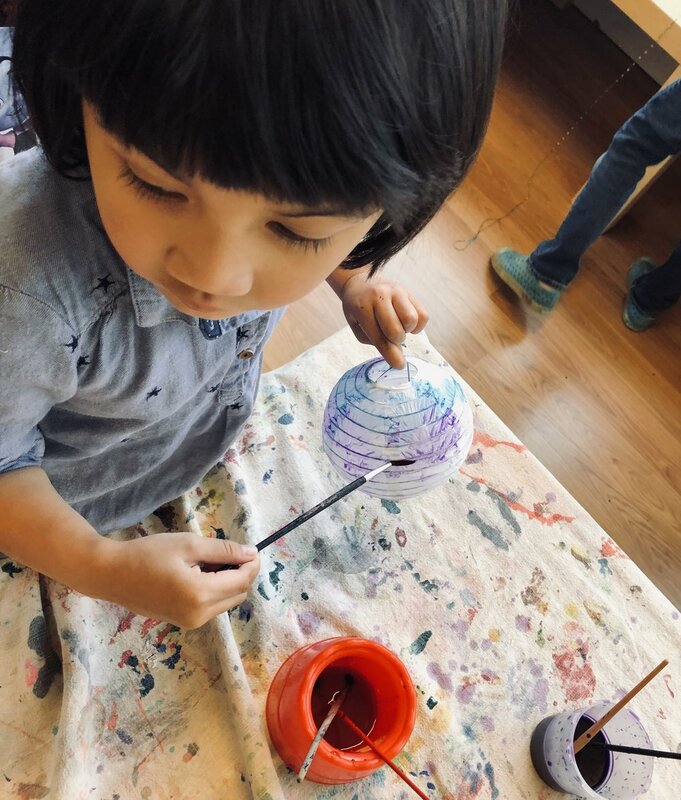 From jellyfish and axolotls to water games and ice excavation, we will submerge ourselves into cool textures and shape-shifting colors with crafts your children can take home each day. Muck & Wonder Farm School-WTV has a new Parent Participation Program at the former Tiny Tots location on Bell Street! October 17th, will take about an hour and will take place in the mornings and afternoons. If you are currently waitlisted- stay tuned as we will be adding more space for families as we begin assessing our roster! We appreciate your patience and anticipate a lovely year of exploration, play, and community building on the farm! Tiny Tots Parent Participation Preschool, which opened in 1949, was the longest running parent participation preschool in the Sacramento area. Generations of children graduated from their play-based, open air learning environment through the years. Art Beast Children's Studio, opened in 2009, has been dedicated to providing creative space for children and families to engage with the arts and one another. In 2018, Art Beast Children's Studio was offered the space. We jumped at this opportunity to imagine Art Beast's values and celebration of play transposed into a space with a huge outdoors. The property will house a newly remodeled and updated play-based, parent participation preschool focused on child-directed play and building a vibrant community of families. 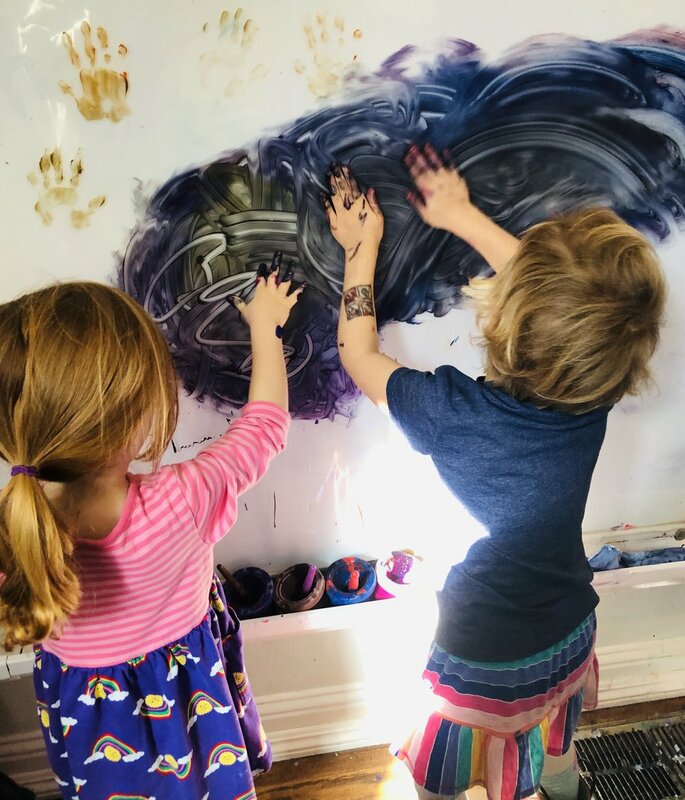 The environment will continue in the legacy of Tiny Tots and in the tradition of Art Beast, creating spaces that offer opportunity for inventive, interactive, and child-directed play. Art Beast is a program of Waking the Village. As with all Waking the Village programs, the proceeds from Muck & Wonder Farm School help sustain our programs for children and youth overcoming homelessness. The community of families gathering at this school helps build healthy communities for more families in Sacramento. The school features a 1200 square foot building with an art studio, a builders space, dramatic play spaces, a loft, and a library. The outdoor space includes climbing structures, swings, dirt and asphalt trails for riding bikes, gardens, a playhouse, and lots of room to move and explore. We are so excited to be building our community of families! We will begin sessions for the 2018-2019 school year on September 4th, 2018. If your family is interested in joining, complete the registration below. You can complete your registration now (and secure a spot) or indicate interest on our wait list form so that we ensure you receive updates as we get closer to September. We will be holding an Open House in August once final renovations are complete to tour the space and meet the directors. Art Beast Child Development Center is launching its School-Age program for 6-12 year olds this summer! Offerings will include yoga and meditation, drum and song circles, storytelling, hip-hop, ballet, poetry and science. Local transport from elementary schools will be provided during the school year. Visit wakingthevillage.org to sign-up for our waitlist! PLEASE NOTE! THIS IS NOT AT OUR MIDTOWN CHILDREN'S ART STUDIO. A new tradition! The Festival of Changemakers was truly inspiring. Thanks to all the friends who showed up to share wisdom and make magic. Not only did we raise funds for Waking the Village, we gave a community of girls a chance to work those muscles of raising your voice, pushing past discomfort, doing something ridiculous, making something beautiful, and, most of all, sharing their very hopeful visions for the world we share. The Changemakers are here! So many of our girls grow up hearing, "Just wait until she is teenager." Well, after an amazing day spent with 9 to 14 year old girls at the Festival of Changemakers, we can say: We can't wait to see this generation continue to grow. Yesterday, a community of girls gathered at the river to create, sing, dance, and build a community where we sweeten the world by offering up our strengths, our bravery, our love, and our commitments. Please support Waking the Village/Tubman House for the Big Day of Giving! "My least favorite part of my job (asking people for money) makes the best part of my job (supporting rockstars like the graduates below) possible. We do a lot to avoid asking folks for donations. We created Art Beast and festivals and child development centers so we can MAKE money to sustain our homeless programs and not have to repel all those we love with constant shake downs. But, the hard fact is, we need you. We have grown so fast and the funds just can't keep up. We have happy endings to manifest- so hope you'll consider helping us out on Big DOG. We have $10,000 match waiting to double the value. You can schedule any time: https://www.bigdayofgiving.org/wakingthevillage"
PS Sharing our posts on Facebook and Instagram or telling others about our organization makes a massive difference in getting seen and spreading the word about all that we do. Many of the youth Waking the Village serves are pregnant and parenting moms who often don't have a strong support network to raise a child. Waking the Village provides a nurturing home environment for youth and their children, as well as free childcare through our Art Beast Child Development Center. Our intensive-coaching model focuses heavily on supporting our young and often first-time moms so that they can be confident parents and foster healthy relationships with their children. 100% of our pregnant residents connect to quality prenatal care within two weeks of entry, attend birthing classes, write birth plans, and have staff support during the birth. 100% of parents participate in Waking the Village’s programs to strengthen parenting skills and report a greater capacity to provide developmentally sound care and environments to children. There's over 75 youth and children on our wait lists right now. Two years ago, they would have been waiting on 8 spots. 68 we would never meet. They would evaporate over time. We would be haunted by the possibilities never offered them. Well, thanks to a team FULL of fight and a community that believes in us, we call those days done. In 2016, we launched 12 more units for families. We also launched the Creation District to create a hub for youth in our community to build connections and get help- even while they wait for housing. In 2017, we opened two more houses, launching Sacramento's first transitional housing program for LGBTQ youth and adding 8 more units for youth and families. We also opened a licensed child development center to offer free childcare to the children in our programs. In 2018, we created flow in our housing programs by partnering for access to Housing Choice Vouchers that allow out clients to move into subsidized apartments with on-going case management so that they have more years to claim degrees and careers and stability. We also created three new positions. An Employment Specialist will work with the youth in all our programs, building relationships with employers and supporting our youth in getting and keeping jobs. A Housing Specialist will develop tenancy skills and build landlord relationships so that our graduates are leaders within their apartment complexes. A Prevention and Intervention Specialist will work with youth on our wait list to ensure they connect to housing and needed services MUCH faster. In fact, we are partnering with Lutheran Social Services and Wind to get all three youth providers into the new youth center so that we greet youth on day one of homelessness with expertise and kindness- and a swift path to housing. The Creation District will center in the space to provide joy and connection- and use the new ArtReach van to get into all corners of the county. Art Beast @ The Library-Free community programs sponsored by your local public library and hosted by Art Beast! Come create with Art Beast at your local library! -North Sacramento Library: Día de los niños/El día de los libros celebration-Sat, April 28th 2:00 bilingual storyteller (not Art beast) & 2:30 Mexican Maracas project with Art Beast. Art Beast enjoyed spending the day at the Chalk It UP festival at Fremont park making art with families. Call the studio today to sign up! Limited space. Join us for a week of exploring art through sound and motion! Campers will be able to participate in activities such as jazz-painting, storybook art, and messy music. We will be dancing, singing, drumming, and playing instruments as we build a bridge between the world of art and the world of music. Let's get ready to explore different musical styles such as Jazz, Classical, R&B, Rock 'n Roll, and World Music. Come make new friends and travel the ancient world by exploring mythology! You may already know some stories and characters like Aphrodite and Isis, some may be new to you, but all will inspire our own artwork, stories and costume pieces. We will travel to varying continents including Africa, Europe, and Asia to make amazing creations like a life-size sarcophagus and mythological masks. Together we’ll share stories, play games, and make art! 4-day week – no camp July 4th. Camp balance will be pro-rated. Our Starry Night Space Camp will revolve around a variety of creative art projects focusing on the wonders and vastness of what is in the night sky. 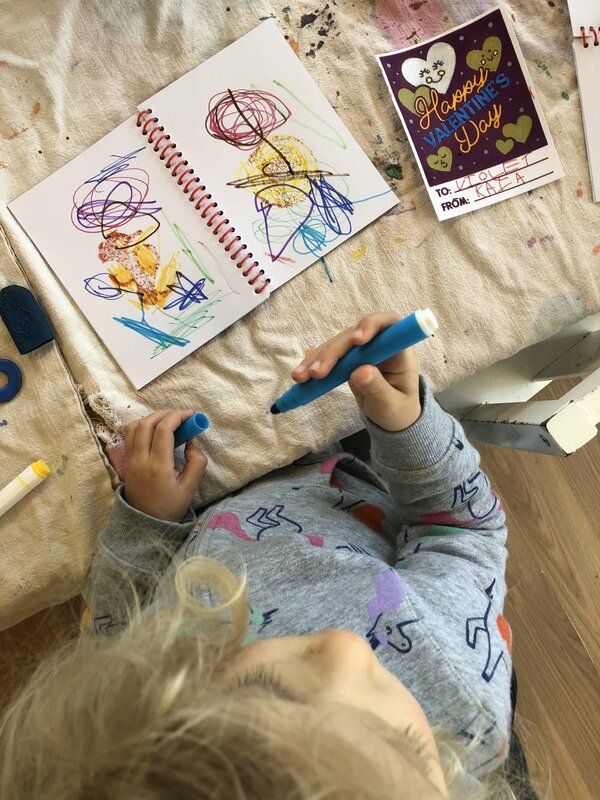 Children will surround themselves in different sensory arts and crafts and learn about different features in space while making friends and exploring what our studio has to offer. Campers will make something new to take home each day including 3D star mobiles, mini telescopes, and space paintings! Where science meets art, imagination intersects facts, and creativity collides with observation. Put on your science goggles and art aprons and jump in to our weird science camp! Join Andrew and Leslie for a fun-filled week of slime making, sensory experiments, painting rainbows and more! We’ll have a guest visitor lead a special craft: an origami, pom-pom launcher! Come meet new friends with hands, claws, and paws while we dig into stories and tales from varying cultures. We will explore fables, illustrations, and elements of story-telling while incorporating animals from all over the world through activities like puppetry, picture stories, and acting. Bring your over-active imaginations and an Art Beast attitude! Campers will take home a story box at the end of the week with all of our creations! June 19th-June 23rd : From the Ground Up! During the week, campers will enjoy building and piecing together resources in imaginative ways! Throughout the camp we'll build our own cardboard forts, tinker trophies, and our own rockin' obstacle course. Children will also work on cooperative games and tasks as they learn to create and reinforce friendships. Bring your builder's brain! Teacher Biography: Nancy is a student at Sac State, a drum line instructor at local high schools, AND she is the Co-Assistant Director at Art Beast. She has worked and taught several music and art classes at Art Beast since 2013. As an avid creator, she is also the designer of the many whimsical creatures and scenes that fill our front windows and studio. Whatever her pursuit, Nancy brings much originality and fun into the experience of her classes and camps. Welcome to the most joyful and advanced superhero academy ever! New recruits are invited to come and train with the most intelligent and skilled superheroes in the world (you and your camp friends)! As a part of this elite program, we will create our own superhero names, assemble our own armor (super hero cuffs, shields, and capes), decode secrets messages, go through an agility training course, and create long lasting friendships and memories. By the end of the training, we will discover what it takes to become not just a superhero, but someone who can make a difference in the world. Teacher Biography: Andrew has been an Art Beast coach and teacher since 2012 and is now the Co-Assistant Director. He studied Fine Arts, graduating from CSUS with a minor in Apparel Marketing and Design. Andrew has done nearly EVERYTHING at Art Beast from keeping the center tidy to managing the piles of paperwork at the front desk, from teaching camps and classes to providing excellent customer service to visitors. Andrew’s gentle spirit, constant smile, and his love of all things Super Hero has made him a favorite among staff and families alike at Art Beast. Join us for a fun filled science adventure! During this 4 day camp (no camp on Tuesday) we will be exploring various science disciplines and we will “meet” some famous and some lesser known scientists while sampling their various fields of study with an emphasis on under-represented individuals like women and people of color. We will look at fossils, plants, animals, rocks, and crystals- and dabble a bit in chemistry and electronics. In additional to our scientific discoveries, we will also make extraordinary art each day, share books, and play games related to our topics of study. There will be erupting volcanoes, fizzing paint, rainbow clouds, dino dough, journaling and much more! Teacher Biography: Leslie is a mother, artist, and children’s librarian with a passion for bringing stories to life through art and encouraging families to get messy! Leslie has a Masters of Library Science degree and over 15 years of experience working with children and families in libraries and community centers. With an undergraduate degree in Photography, Leslie has been a lifelong lover of the arts who has dabbled in many mediums. She loves sharing stories and songs with children and finding playful ways to use art and movement to build confidence and creativity. July 10th-July 14th: Music Around the World! Let's take a trip around the world as we explore songs, dances, stories and art! Each day of camp will be an opportunity for campers to learn about countries such as Mexico, Ghana, and Ireland. We will explore different art and music styles and play fun music games. Campers will have many opportunities to sing freely! We will also learn basic music notation and how play the glockenspiel (xylophone). No previous music experience necessary. Teacher Biography: Ariana is a musician and mother and has been a music educator for over 20 years, teaching music and movement classes and piano lessons to students of all ages. She studied classical piano performance at UC Santa Barbara and has specialized training in early childhood education and early childhood music. She has been teaching classes at Art Beast this past year as well as working at a local elementary school. Ariana brings a warm, welcoming vibe to all that she does and she brings the joy of music to children in a playful and highly engaging way. Campers are invited to bring every bit of imagination and whimsy into creating a whole new world. Each day of camp we will create our own characters and landscapes as we interact with exciting fictional forces. Activities will include plenty of arts and movement as we engage in wand-making, treasure-hunting, and building our very own class pet: a dragon! Teacher Bio-See Nancy above. July 24th-July 28th : 5, 4, 3, 2, 1... Blast Off to Outer Space! August 7th- August 11th : Sound Explorers! August 14th- August 18th : It's a Monster Mash! This camp is for fans of extra limbs, eyes, and teeth - or lack thereof. During this camp, we'll explore what it is that makes a monster and the odd beasts that we hear about in stories. While exploring our best monster behaviors, we'll tap into monster games that help us meet each other and become friends! As the week moves on, our campers will slowly turn into monsters of their own creation - with beast feet, hats, and accessories that they conceptualize through the week. Together, campers will also explore the sensory formations of various monster gucks and goos. Join us at the end in our decorated beast zone for a monster mash dance to meet your new monster! Nancy and Sonya will teach this class together. Teacher Biography: Sonya has worked as an Art Coach the last three years and has been a birthday party host for 2 years. She debuted as a camp teacher last summer and got rave reviews from the kids in her gardening camp. Her kindness, warmth, and joy in creating with children ensures that a wild and wonderful time will be had by all again this summer. Join us on a hunt for all things mythical and magical. Over the course of the week we will explore all sorts of fantastic creatures, including dragons, unicorns, fairies, wizards, and elves! We will use our imaginations and artistic skills to build a mini, make-believe world of fun and adventure. Each day will include stories, games, and science or art activities that reflect our magical theme. Projects include: magic wands, science inspired potion making (some edible), dragon puppets, golden slime, magical creature companions, fairy gardens, and much more. Teacher Biography: Leslie is a mother, artist, and children’s librarian with a passion for bringing stories to life through art. Leslie has a Masters of Library Science and over 10 years’ experience working as a Children's Librarian. With an undergraduate degree in Photography, Leslie has been a lifelong lover of the arts who has dabbled in many mediums. She loves sharing stories with children and finding ways to use art and movement as a means to bring them to life. Join us for an interactive adventure exploring all things science! We will have fun learning and creating as we journey into space and physical sciences, botany and plant growth, and the wonders of the human body. Campers will enjoy identifying constellations and making nebula jars, watching sprouts grow, erupting volcanoes, and understanding how our lungs work. Anticipate an exciting week of experimenting and scientific discovery. Teacher Biography: Mariah is Assistant Director of Art Beast Children's Studio and a seasoned camp teacher. She is also a baking and pastry chef who enjoys yoga and Nichiren Buddhism. Mariah is inspired by the arts and has a passion for the fostering and development of young, capable minds. Join us for a week of flavor and fun as we explore our palates and palettes! Campers will immerse themselves in creating a healthy snack each day out of fruits, flours, and vegetables. We'll be mixing, mashing, and whipping up snacks and crafts- decorating chef's hats, printing with cooking tools, and making our own recipe books. We will also work in a science experiment or two exploring the energy hidden within the deliciousness. This camp is all about playing with your food! Teacher Biography: Nancy is a college student, a drum line instructor at local high schools, AND an Art Beast teacher and art coach. As an avid creator, Nancy is also the designer of the many whimsical creatures and scenes that fill our front windows and studio. Whatever her pursuit, Nancy brings much originality and fun into the experience. Join us for a week filled with the art of storytelling. This camp is perfect for the budding novelist, comic enthusiast, shadow puppet master, and anyone who just loves a good story. Camp activities will include exploring settings, characters, and plot, making puppets of all kinds, building shadow puppet theaters, book making, comic stripping, storytelling games, and more. No reading or writing necessary for this camp. Bring your imagination and get ready for an adventure! Teacher Biography: Diana has experience both as a teacher and as an artist. She has two very artistic young daughters whom she homeschools as well as leading homeschool groups for other families. She works in many mediums and is especially interested in fostering a community of young artists who learn and grow by looking at art throughout history and by creating a dialog in the classroom as well as creating meaningful artwork together. Join us as we journey across the world in search of exploration, creativity, and adventure. Everyday we’ll be visiting a new continent on a contraption of our own making. We’ll make cars and planes, learn about the mummies in Egypt, make origami in Japan, head to the Artic zone to learn about polar bears, go on a safari, and use our brains, bodies, and creativity to explore the world around us. As our Beasties travel so will their imaginations. Ready? Set…TAKEOFF! Andrew has been an Art Beast coach and teacher for 3 years. He studied Fine Arts, graduating from CSUS with a minor in Apparel Marketing and Design. When he is at Art Beast, you can catch him leading the Messy Science class, teaching kids the hows and whys of slime, bubbles, and an array of chemical reactions. Dive into the past as we study large creatures of worlds real and imagined! Campers will create triceratops masks and see through a brachiosaurus' eyes. We'll investigate the existence of dragons as we create dragon footprints and our very own dragon eggs. We will sculpt and shape dinosaur habitat dioramas and unleash our creations. Campers should be ready to roar and roam! How does your garden grow? Come and join us as we explore all that grows around us! Be prepared to get those hands dirty and those thumbs green as we dig for worms in the soil and help the fairies with their gardens. Children will create take-home gardens and fairy houses, mason jar terrariums, garden stones, dragon fly dolls, and butterfly wings in this magical exploration of gardening. Teacher Biography: Sonya has worked as an Art Coach the last two years and is celebrating her recent graduation from high school. Her kindness, warmth, and joy in creating with children ensures spirits will be blooming in this session. Time to dive into an underwater adventure as we explore the creatures and habitats below the water’s surface. We will learn about octopus, jellyfish, crabs, fish, and whales as we craft, tell stories, and move like the beings of the sea. We will make glittery octopus ink, jellyfish bottles, and starfish. Each child will also create a canvas of their own underwater habitat with seaweed gardens and coral to invite on-going imaginings of the vast world of the ocean. Let’s explore sound, texture, and color in fun and messy ways as we get to know each other. Campers will mix their own puffy paints, tackle pendulum painting, and invent things oozy. We will make our own rattles, shakers, and jingles as we explore sound and timbre. As the week progresses, campers will start to overlap noise and creation with hanging wind-chimes and dance paintings. Come on the last day to pick up your child and take part in our cacophonous beast parade! Explore creativity and the wonders of Winter in this year's Camp Winter Wonderland. Art Beast camps are designed for children 4 to 7 years old. We create a space that honors children by offering activities and environments suited to their age range. No trying to keep up with the 10 year olds at this camp! Each session fills at 16 children and is led by two teachers, promising a group that can grow close. The camps offer a blend of structured arts exploration in the classroom and free play within the building, always under close supervision by the camp teachers. And, as always, when you choose Art Beast, your money supports Tubman House, a community for young, homeless parents and their children. A portion of your camp fee is tax deductible. Pricing: $150. Additional siblings enrolled the same week receive a 15% discount. $50 non-refundable deposit to reserve a space. Come share your love of animals with others! In this camp, we will imagine ourselves as animals in the wild, making masks and costumes, telling stories, and learning to move with the stealth and grace of beasts and birds. We will create animal habitats and play team building games that teach us more about animals behavior. Together we will create a play about our animals sharing our new wisdom about life in the forests. We will also focus gently on nature conservation, exploring ways we can take care of our planet so that all animals thrive. Teacher: Cara Patton: Cara holds a Masters Degree in education and has taught both elementary and preschool students in project based schools. For the past 3 years, she has been leading a program called Nature and Self Discovery that uses nature education, writing, yoga, meditation, and a range of arts to connect children to self, nature, and one another. Ready to create art using only natural materials? Let's make paint from wild leaves and berries, paint with pine needle brushes, and weave with fronds. We will learn about natural artist Andy Goldsworthy to inspire our art projects. Using nature is a great way to connect to our Planet—the best part, nature will also provide more materials for us to create with. Together we will create group projects as well as individual projects to take home at the end of the week. Class projects include Nature Mobile, Collaborative Nature Mural, Clay and Cob Work, “If I was a Tree” Poem Book, Nature Mosaics, Rock Sculptures, and Fairy Houses. June 29 – July 3 Sailors and Divers Camp: A Camp for Exploring the Sea, Above and Below. In this week long camp, we will learn about the power of water and creatures of the sea: both legend and real. We'll create our very own pirate ship for traveling through oceans and rivers all around the world, build para-scopes for submarine exploration, and enjoy water crafts and water play each day. As camp progresses through the week, our camp room will slowly submerge and we'll learn more about the creatures that inhabit the water around us. We will create, build, and decorate beautiful take-home creations that represent our day's explorations. Eye-Patches and sailor hats welcome! Teacher: Nancy Hamaker: Nancy is a college student, a drum line instructor at local high schools, AND an Art Beast teacher and art coach. As an avid creator, Nancy is also the designer of the many whimsical creatures and scenes that fill our front window. Whatever her pursuit, Nancy brings much originality and fun into the experience. Join us as we explore the African wilderness and all it has to offer. We will journey through the wild wearing our safari hats and vests, identifying and learning about our animal friends and their habitats. We will make our own binoculars to see the animals far off in the distance and fasten cardboard jeeps to journey many miles on our safari. Campers will jump into crafting, making lion masks and practicing their roars, creating hippo collages, and having fun with zebra marble painting and egg carton crocodiles. We will play silly animal games and learn why "Giraffes Don't Dance!" Mariah is looking forward to an exciting safari adventure with her campers this summer, so be prepared for fun! Teacher: Mariah Nall: Mariah is Assistant Director of Art Beast. She has been a camp teacher and art coach at Art Beast for over four years. Whether she’s in the courtyard helping give the babies a bath or at the desk greeting our families, Mariah enjoys working with the children and watching them grow. When not working, you can find her cruising midtown on her bike, hitting up the local café, or spending time with friends. Mariah recently graduated college with a degree in culinary arts. Mariah is super excited to explore and create with the campers this summer! Campers can tap into their inner builders for a week full of building and creating! Together we'll create larger projects like mazes, houses, cars, planes, and forts. We’ll also create a variety of take home projects like cities, castles, and frames. We will build will a range of supplies, using cardboard, pipes, and wood to complete projects. During our time together each child will be given time to brainstorm an idea and given the time to continuously create it throughout the week! 3...2...1... Get ready to take off to another world as we explore the marvels of the universe around us! In the beginning of the week, we'll prepare for take off by creating our very own astronaut costumes, topped with paper maché helmets. As we get farther away from our home planet we'll learn about stars and planets by making flashlight constellation projectors, and mix together our very own galaxy dough to feel the presence of the galaxy around us. And what space camp wouldn't be complete without building our very own chemical reaction rockets? Culinary Art graduate and cook extraordinaire, Mariah will lead this camp as we discover the science behind cooking. Campers will delve into the world of rising agents, acids, & chemical and heat reaction as they use science to make their snacks. 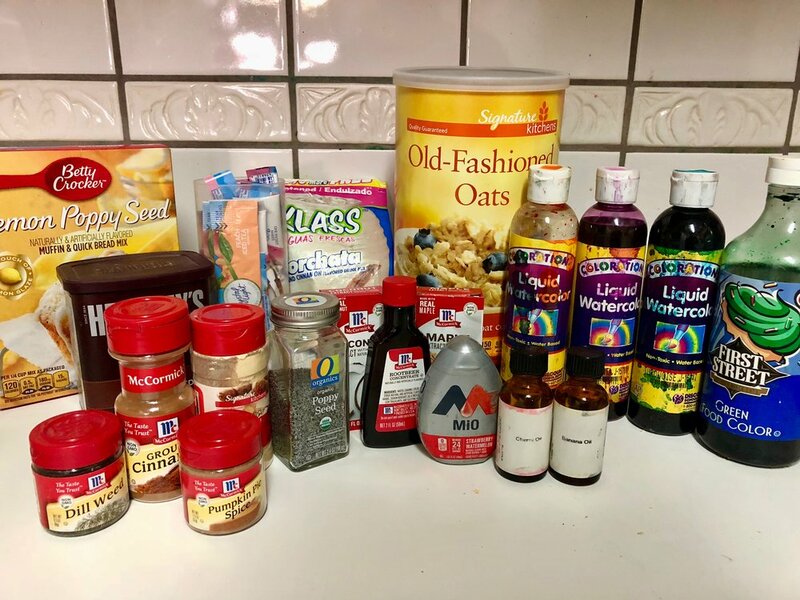 Science chefs will make edible geodes, shake milk into whipping cream, rise doughs, mine iron from their cereal, and use seaweed to make gummy worms. We promise plenty of play and silliness mixed into a good dose of science. Dive into experiments that will amaze while teaching some of the basics of chemical reactions and scientific truths. Young scientists will growing rock candy, createrainbow flowers bouquets from white daisies, shine pennies, use hot chocolate as a solvent, blow up a balloon without using a single breath, and power a boat with baking soda. We will paint with vinegar explosives, use inertia to conduct magic tricks, and attempt to briefly defy gravity as we build hover crafts. Teacher: Andrew Macaranas: Andrew has been an Art Beast coach for 2 years. He studied Fine Arts at Sacramento City College and transferred into California State University Sacramento where he graduated in Family Consumer Science minoring in Apparel Marketing and Design. When he is at Art Beast, you can catch him leading the Messy Science class, teaching kids the hows and whys of slime, bubbles, and an array of chemical reactions. This whimsical camp will center on building, crafting, and making familiar things with unusual supplies. We will create a tinkering lab where children are encourage to get inventive and look at new possibilities for creating. Whether engaging with an instrument making buffet or raising castle walls from milk cartons and dissected electronics, campers will be immersed in the world of invention. This camp is for fans of extra limbs, eyes and teeth - or lack thereof. During this camp, we'll explore what it is that makes a monster and the odd beasts that we hear about in stories. While exploring our best monster behaviors, we'll tap into monster games that help us meet each other and become friends! As the week moves on, our campers will slowly turn into monsters of their own creation - with beast feet, hats and accessories that they conceptualize through the week. Together, campers will also explore the sensory formations of various monster gucks and goos. Join us at the end in our decorated beast zone for a monster mash dance to meet your new monster! Campers will dive into Spanish art and culture on this whirlwind trip to Spanish speaking cultures of the world. Each day will be full of bilingual games and music that will help campers discover the many traditions and cultural crafts of Latin countries. We will make sugars skulls and learn a traditional folk dance from Mexico. Campers will make enthralling matador vests and fans from Spain, build Aztec pyramids and create feather head-dresses from Central America. They will also explore the sensational drumming from Puerto Rico! Get ready to have your child come home and greet you in Spanish. Sera fantastico! Teacher Bio: Maggie Gomez is a lively and fluent Spanish speaker who celebrates her Mexican roots. In addition to working as an art coach and teacher at Art Beast, Maggie is a devoted mother. Maggie also comes with years of experience working as a child development teacher at Tubman House. In this song and dance camp, children will create stories and sets, design costumes, sing at the top their lungs, and reinvent themselves each day as they learn the joys of acting. Skits, movement games, improv activities, and song circles will bring story after story to life. A range of art techniques will be introduced to create the props, costumes and special effects that build the imaginary world of the theater. We will celebrate our week of acting with a lively performance on Friday afternoon. Teacher Bio: Tiffany Hannah is a classically trained dancer, and has performed ballet, jazz, tap, and modern throughout California, and Florida. Tiffany grew up taking dance, and spent six years at a performing arts academy, as well as three years teaching dance at Sacramento elementary schools where physical education budgets were cut. In addition to teaching, she has taken workshops from the prestigious Alvin Ailey Dance Company as well as Stomp! In these environments she developed a strong love for the art of dance and teaching. Tiffany has spent the past seven years as a preschool teacher and elementary age tutor in Sacramento, CA where she encourages learning through play and discovery. Tiffany is also a dedicated student herself, and will soon finish up her degree in Health Science and Healthcare Administration. Twirl, jump, bend, pop, glide, tap and explore movement and music of dance around the globe. Group games, songs, daily art, and costume making are just a few highlights of this playful, whimsical, and self-esteem encouraging camp. We will explore traditional dances from each continent while still making plenty of time to explore ballet, tap, hip hop and jazz. Loose fitting clothing and socks are a must. July 7 to July 11 Science and Art Explosion! This camp approaches art as a giant experiment. Campers will create and experiment with a range of safe chemicals and awesome reactions. We explore acids and bases, water and oil, and all sorts of mad scientist combinations to generate unique art. 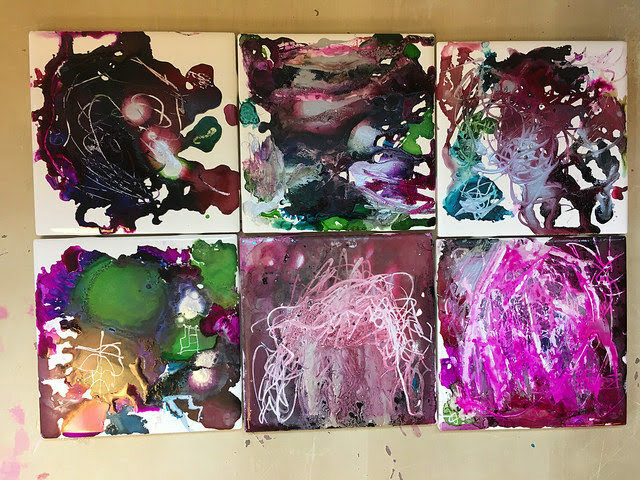 Projects will include: water color canvas using glue and salt, jumping colors, splatter patterns, baking soda and vinegar art, and an array of goo and slime. Teacher Bio: Mariah Nall is a culinary arts major and aspiring pastry chef. She has been a camp teacher and art coach at Art Beast for over three years. Whether she’s in the courtyard helping give the babies a bath or at the desk greeting our families, Mariah enjoys working with the children and watching them grow. When not working, you can find her cruising midtown on her bike, hitting up the local café, or spending time with friends. Mariah is super excited to explore and create with the campers this summer! Join us for a week all about space! Everything from planets, stars, aliens, the sun and the moon will be discussed and created. Starting with planet Earth, we’ll discuss the sky and what lies beyond. Campers can look forward to making astronaut costumes, alien goo, take home clouds, a full space diorama, homemade rockets, and much more! As we continue to deepen our understanding of our planet and space through storytelling, song and movement, we'll let our imaginations lead us. Teacher Bio: Michael has been an art coach at Art Beast for over two years. He also recently graduated from Sacramento State with a BA in Family Studies and a minor in Deaf Studies and is a 200 hour registered yoga teacher. When at Art Beast you can find Michael putting on a puppet show with children, teaching Messy Science classes, and leading Friday Little Beast and Big Beast Workshops. Michael is thrilled to be able to share his enthusiasm and passion for exploration of the arts and yoga this summer! Campers can tap into their inner builders for a week full of building and creating! Together we'll create larger projects like mazes, houses, cars, planes, forts, and rockets. We’ll also create a variety of take home DIY projects like cities, castles, and frames. During our time together each child will be given time to brainstorm an idea and given the time to continuously create it throughout the week! Come follow this band into the world of rhythm and glorious noise. 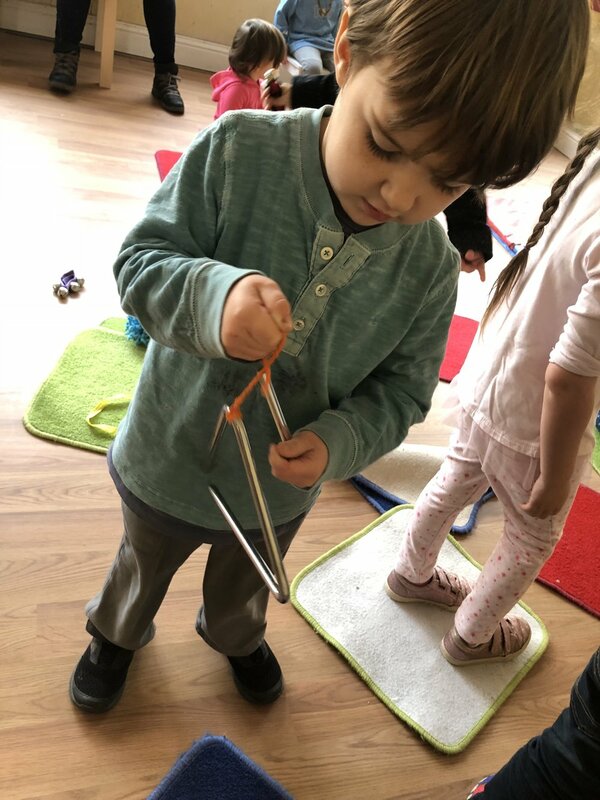 Make wind and percussion instruments, discover the beats our bodies can make, and discover a range of possibilities in creating sounds and beauty from the everyday. As always, plenty of art and a range of mediums will be integrated into our instrument building. Of course, Friday will celebrate our week with a performance of our newly hatched Art Beast Marching Band. Teacher Bio: Deborah Cardoza has been an Art Beast teacher for 3 years. She studied Percussion Performance under Dr. Daniel Kennedy at Sacramento State where she earned her B.A. in Child Development and has been a member of the Sacramento State Symphonic Orchestra, the Sacramento State Percussion Ensemble and the Bay Area Women's Percussion Troupe. She currently performs with Gamelan Dharma Santi and enjoys teaching to a wide variety of community members including high school students, developmentally-delayed adults and Art Beasties! This camp is all about the dinosaurs! Children will create a prehistoric world and explore art and science through dino sculpture, volcano eruptions, and fossil casting. Make dinosaur eggs. Fashion dinosaur tails and feet. Assemble dinosaur skeletons. Make a flying pterodactyl. Come join the adventuring! Campers will dive right into the messy part of science as we explore a new theme each day. Working together we'll use our silly ideas, playfulness, and curiosity to hypothesize and experiment. Campers will make and investigate alien goo, rubber bones, water blobs, and all things silly and scientific. An under the sea meets yoga camp! Each day campers will explore a new fact of the deep sea. Together we’ll learn about the different animals, habitats and creatures that make up the vast ocean along with waves, currents, and tsunamis. Oceans in a jar, flowerpot sharks, life size mermaids and mermen, and aquariums are but a few of the projects campers can create. During our time together we’ll also move and stretch our creativity and bodies as we explore various aspects of yoga that welcome silly ideas, playfulness and spirit. Each day will include yoga poses, circle time, storytelling, art and team building games. Limit: 15 Children. Workshops are designed for children between 7 and 11 years old. Cost: $90 plus $30 supply fee (or $40 for a single session). Teachers: Bridget Alexander and Blithe Raines, founders of Art Beast Children’s Studio. 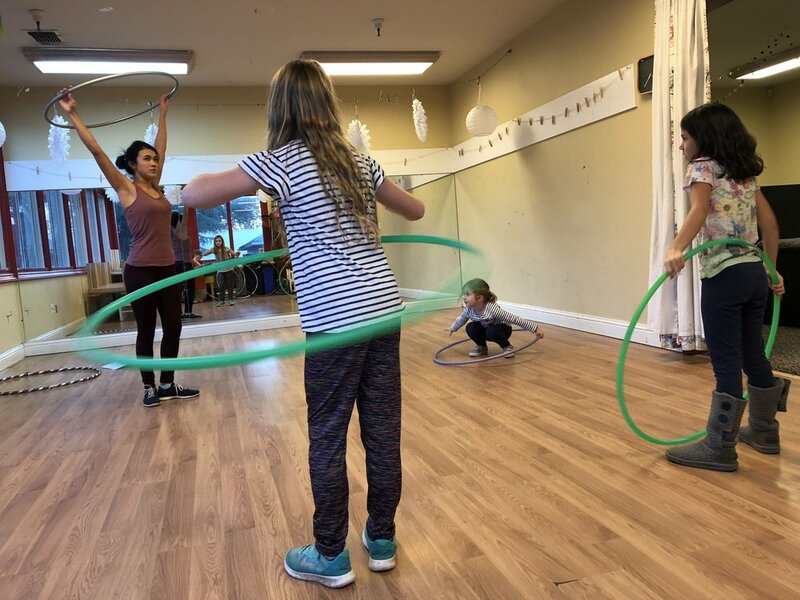 As moms, teachers and winter holiday enthusiasts, Blithe and Bridget will bring their experiences of creating with kids to this series of workshops. Ready to register? Please register online here or by calling the studio at 916-441-1233. Limit: 15 Children. Workshops are designed for children between 4 and 6 years old. This exciting art class will explore the characters of the Greek mythological adventures. Children will draw and paint Medusa, Athena, Hercules, and many more. The stories will be brought to life with a creative use of drawing and painting styles. Courtney is MonArt trained and uses MonArt methods to develop technique. Please join us for this eight week session as we learn to draw and paint our way through these famous stories of ancient times. Travel around the world and discover its architectural wonders in this drawing class. Students will draw the Eiffel Tower, Pyramids, and other famous buildings as they develop drawing technique. The children will also learn to design our own buildings using their new found skills. Courtney Tice is an artist and Monart trained children’s art teacher. In addition to training with Mona Brooks, Courtney opened a Monart franchise school in 2006. Courtney has taught art throughout the community, putting her degree in art education and her passion for art to work with a range of ages. Courtney has been an artist in residence and implemented over 53 art exhibitions. Her passion is art history, figurative painting, and watercolor. She believes that art can build confidence in a student and raise levels of focus in the classroom. Where to start? Idioms, metaphors, similes, alliteration, stanzas, phrasing, point of view, rhyme schemes, acrostic, haiku, cinquain, tanka, limerick - the list goes on and on. We will read poems. We will write poems. We will paint poems, sing poems, dissect poems and we will dance poems! Poetry and children are like Sea Monkeys and water as you witness growth right before your eyes. Frameworks will be in place to foment the creative juices in each and every poet involved. Culminating practice will include a poetry slam- black beret optional! Kate Raines has been in love with the English language as long as she can remember. Her 2001 New Year’s resolution to “read a poem a day” has only been broken a handful of times and she resolutely believes she has a keener perception of the world because of this word-infused diet. Kate has a B.A. in English, an elementary teaching credential and a Master’s in Education. She has spent the last eight years as a preschool teacher and also teaches writing-intensive classes as a full time adjunct professor at Sac State with four sections of Multicultural Children’s Literature upcoming in the Fall. Hero Camp: A Camp for Superheroes and Stars of their own Story (June 17-21) Art, drama and music collide in this celebration of wonder girls and super boys. In addition to making capes, masks, and hero tools, the children will tell the story of their hero in a range of art styles. Daily dramatic play and movement games will bring imaginative worlds to life as children create characters and act out their feats of strength and heroism. Teacher Bio: Deborah Cardoza has been an Art Beast teacher for 3 years. She studied Percussion Performance under Dr. Daniel Kennedy at Sacramento State where she earned her B.A. in Child Development and has been a member of the Sacramento State Symphonic Orchestra, the Sacramento State Percussion Ensemble and the Bay Area Women's Percussion Troupe. She currently performs with Gamelan Dharma Santi and enjoys teachingto a wide variety of community members including high school students, developmentally-delayed adults and Art Beasties! The Sound and Creativity Quest (June 24-28) Travel into the jungles of inventiveness to find music and art all around. Children will create one-of-a-kind maps, build a sound wall, make wind and percussion instruments, design graphic music notation art, and discover a range of possibilities in creating sounds and beauty from the everyday. Teacher Bio: Liz Barton is a musician and educator with a Master's in Horn Performance. She is lead Teaching Artist with VITA Academy and also provides instruction at Esparto Elementary, developing the first music program there in decades. Her career includes private teaching (piano and brass), as well as classroom teaching (recorder and choir). Liz performs in orchestras throughout N. California. Liz loves performing chamber music and is active with Classical Revolution Sacramento. She recently performed classical music with homemade instruments from pvc pipes, hoses, funnels, and balloons. Yoga and Art Explosion (July 1,2,3,and 5) Children will move, contort, and stretch their creativity and their bodies! Each day will include yoga poses, circle time, storytelling, art and team building games. Magic wands, felted hearts, nature crowns, and sun catchers are just a few of the crafts we will explore. 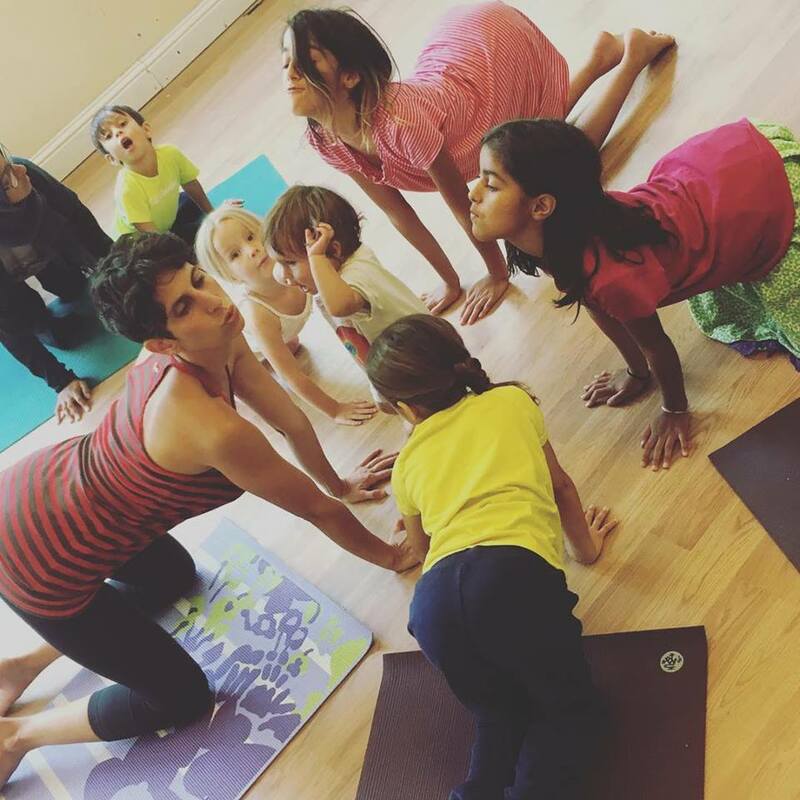 Yoga for children welcomes giggles, silly ideas, playfulness, and spirit. This camp is offered at a reduced rate of $140 as a four day camp. Teacher Bio: Jenna Maggard is owner of Hand for Humanity massage, a preschool teacher and a long time yoga instructor. Jenna has also practiced ballet throughout her life. Jenna is dedicated to practicing and teaching yoga, raising her son, studying early childhood education, buying local, eating healthy, riding her bike, making art with friends, and being an integral part of her midtown Sacramento community. Jenna’s been working with children for 7 years and sees no end to this journey. Up, Up and Away! (July 8-12) Come and explore the things that soar in this weeklong camp focusing on the art of flight. From flying fish to rocket ships, campers will blend art and science with a lot of imagination. Through a variety of mediums, campers will create their own two and three dimensional works of art. We will also join together for group projects and creative exploration. Teacher Bio: Engaging with young people as they explore their creative process is an absolute joy for Lyndsey Roush. Since 2006, Lyndsey has been working as a teaching artist throughout the San Francisco and Sacramento areas. She holds a BFA in Sculpture from the University of Texas San Antonio and a Masters in Psychology from the Institute of Imaginal Studies – merging both to create a nurturing, collaborative learning environment. Fairy Gardens and Gnome Homes: SESSION FULL(July 15-19) How does your garden grow? Come and join us as we explore all that grows around us! Be prepared to get those hands dirty and those thumbs green as we dig for worms in the soil and help the fairies with their gardens. Children will create take-home gardens and fairy houses, mason jar terrariums, garden stones, grass seed dolls and wind chimes in this magical exploration of gardening. Teacher Bio: Mariah Nall is a culinary arts major and aspiring pastry chef. She has been a camp teacher and art coach at Art Beast for over two years. Whether she’s in the courtyard helping give the babies a bath or at the desk greeting our families, Mariah enjoys working with the children and watching them grow. When not working, you can find her cruising midtown on her bike, hitting up the local café, or spending time with friends. Mariah is super excited to explore and create with the campers this summer! The World Wanderers: A Camp for Young Adventurers (July 22 - 26) Join us as we journey across the world in search of exploration, creativity, and adventure. Everyday we’ll be visiting a new continent with homemade briefcases and passports in hand. We’ll learn about the mummies in Egypt, make origami in Japan, head to chilly Antarctica to learn about polar bears, go on a safari, and much more as we use our brains, bodies, and creativity to explore the world around us. Everyday we’ll explore a variety of countries to learn about different cultures, traditions, dances, and folklore. As our Beastie travelers further their exploration, so will their imaginations. Ready? Set…TAKEOFF! Teacher Bio: Michael Benton is currently an art coach at Art Beast. He’s also a full-time student entering his fourth year at Sacramento State as a double major in Deaf Studies and Family Studies. When at Art Beast you can find Michael putting on a puppet show with children, conducting interactive story times, and leading Friday Little Beast and Big Beast Workshops. Michael is thrilled to be able to share his enthusiasm and passion for exploration of the arts this summer! Swashbucklers and Space Travelers: A Camp for Actors (July 29 - Aug 2) Make every day a new adventure! In this theater camp, children will create stories and sets, design costumes, sing at the top their lungs, and reinvent themselves each day as they learn the joys of acting. Skits, movement games, improv activities, and song circles will bring story after story to life. A range of art techniques will be introduced to create the props, costumes and special effects that build the imaginary world of the theater. Teacher Bio: Zoe Carlson-Meyers truly believes in the magic of theater. She has been in a relationship with acting ever since her imagination came alive as a young child. Since then, she has been in numerous productions, varying from Shakespeare to modern dance. She believes that children are the best actors, as they love to play make-believe, shout, dance, and have fun. Because theater is her life, sharing it with young performers is one of her greatest joys.